"BUILT FOR EVERYTHING AND EVERYONE." The world-class EcoTec3 5.3L V8 engine offers better fuel economy than any competitor – an estimated 23 MPG highway for 2WD models – without sacrificing performance. The strong, efficient EcoTec3 V8 generates 355 horsepower and 383 lb.-ft. of torque, so you have ample towing capability and power. E85 is not compatible with this engine. Direct Injection determines the precise measure of highly pressurized fuel to inject into each cylinder to boost power and fuel efficiency while reducing emissions. At cruising speeds when full engine power isn't needed, Active Fuel Management™ (AFM) deactivates cylinders, effectively turning the EcoTec3 V8 engine into a 4-cylinder. When it senses the need for full power, AFM instantly reengages all cylinders. 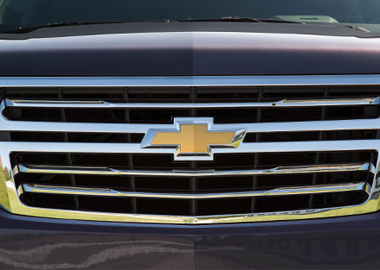 Variable Valve Timing helps ensure Suburban performs at optimum power and efficiency. It continuously adjusts valve timing to keep the EcoTec3 engine operating near peak output, while minimizing emissions. Suburban Z71 Off Road Package takes you anywhere you want to go. A unique grill, chrome badging and18" wheels make a bold first impression. Foglamps, tow hooks and a front skid plate are made for on- or off-road adventure. 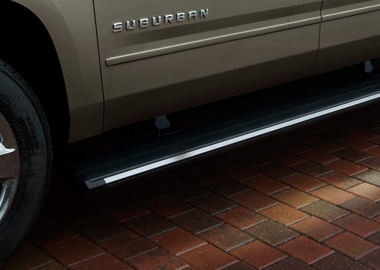 Suburban also offers available power-retractable side assist steps with perimeter lighting, which help passengers get in and out more easily and safely. You'll also enjoy the convenience of available keyless entry and push-button start, which allows you to enter and start Suburban with the touch of a button. Details include an available standard projector-beam headlamps and rear LED taillamps, plus a hidden rear wiper system tucked under the rear spoiler at the roofline. Creating a quiet cabin environment for the driver and passengers was a major focus. Suburban features an acoustic-laminated windshield and inlaid doors with triple seals to help reduce wind and exterior noise in the cabin. Suburban is a storage expert. Look no further than the center console, which is large enough to fit a laptop computer or hanging files. Plus, door storage areas have been maximized to allow room for water bottles, umbrellas, maps and other small items. Behind the third row seats, there is a hidden underfloor storage area. Throughout the cabin, Suburban also features up to 15 cup holders for drinks of almost any size. Charge your phone and other devices on the go with Wireless Charging which eliminates the need for cords. Customize your driving experience by arranging the icons and features on the available 8-inch diagonal color touch-screen. The interface allows you to touch and swipe on the screen just like you do on your smartphone, or you can see your selections on the Driver Information Center. In Valet Mode, the lift-up screen is passcode-protected to help keep valuable items safe and securely out of reach behind it. Once you customize your screen, you’re ready to bring your favorite music and entertainment with you. The new available Chevrolet MyLink Radio works with your compatible smartphone and Bluetooth® wireless technology to stream music and entertainment through the Pandora® Internet Radio mobile app. Or you can listen to select commercial-free programs with the 3-month trial of SiriusXM® Satellite Radio. The latest Chevrolet MyLink Radio even allows you to store up to 60 favorites, including radio stations, contacts, destinations, music and other media. All that music will sound even better thanks to the available Bose® Surround Sound System. The latest Chevrolet MyLink Radio will sound even better, thanks to the available 10-speaker Bose® Centerpoint® Surround Sound System. Drive with confidence knowing that the all-new Suburban has a fully boxed frame and reinforced safety cage with strategically placed crush zones to help maintain the integrity of the passenger compartment in the event of a collision. Suburban has also increased the use of high-strength steel in the A- and B-pillars and roof rails; that, plus added roof reinforcements help improve safety in potential rollover collisions. 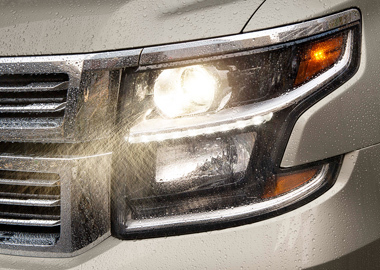 Suburban comes equipped with class-exclusive safety features and driver assist technologies that help protect Suburban drivers and their passengers from all around the vehicle.